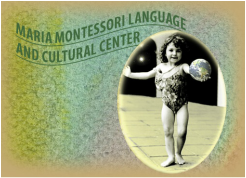 The Maria Montessori Language and Cultural Center (MMLCC) is a 501c3 non-profit organization established in 1999 by Gail Longo, parents, and friends of Cinquegranelli Montessori School. We are registered with the Secretary of State as a charitable education organization and are members of United Way. Board members meet throughout the year on a regular basis. Montessori teachers are certified by training programs that meet national standards. The Maria Montessori Language and Cultural Center (MMLCC) is a non-profit organization that serves as an inter-generational forum where ecological understanding is expressed through cultural renewal, environmental restoration, individual healing, and integrating community. We believe the principles of Montessori education can foster the community to be empowered, aware, thoughtful, and capable of addressing complex issues of our time. The MMLCC was initially envisioned as an after-school program to teach language and culture through theater, art, and music. We quickly expanded our vision by bringing after-school programs into the Nordic Heritage Museum. Then in 2004, we united in partnership with Ballard High School Department of Family and Consumer Sciences and the Seattle Public Schools' (SPS) Community Alignment Initiative in a pioneering effort to provide a unique on-site Montessori Early Education Program and Child Development Lab School on campus. This was also in partnership with Career and Technical Education Department. Beginning with the partnership with Family and Consumer Sciences at Ballard High School under Career and Technical Education, we hosted community workshops bringing together teachers, parents, students, and neighbors. Topics included: Compassionate Communication (Non-Violent Communication), and Empathy and the Brain. The MMLCC continues to bring awareness into our community by exploring interpersonal relationships and their effects on emotions, mind/body development, and mental health. In 2005, we introduced a series of Non-Violent Communication workshops into a Montessori Lab School in partnership with Family and Consumer Sciences at Ballard High School. We began to examine human needs and feelings and social-emotional learning. Now is the time to examine elements of our languages and cultures that no longer serve our common needs. Support Maria Montessori Language And Cultural Center by shopping at AmazonSmile. 1) Go to: smile.amazon.com and login to your amazon account. 2) Search and select: "mmlcc." 3) When you shop at ﻿smile.amazon.com﻿, Amazon will donate to the Maria Montessori Language And Cultural Center. You will see eligible products marked “Eligible for AmazonSmile donation” on their product detail pages. *Note: orders must be made through smile.amazon.com (not amazon.com) in order for donations to be made.